Luke Krajančić (alongside with Miljenko Mike Grgic) are most responsible persons for putting Pošip into limelight of world wine scene and being perceived as the most promising white Croatian indigenous variety. The combination of low yields and modern vinification techniques allow him to crystallize his authentic style where traditional winemaking is lifted to next level whilst staying faithfull to his roots. Luka is also a passionate poet and sculptor who believes in free artistic expression, and himself says that for what he does a certain dose of creative madness is needed. His Pošip sur lie really comes in very limited quantities of only 3500 bottles, but already it belongs among the best dry white wines from Croatia. Maturation is in large, previously used barrels on fine lees resulting with fullness, juiciness and creaminess as dimensions more compared to the vast majority of other stainless steel examoles. Bright golden-yellow color. Thick and copious tears lazily sliding down the glass. Don't serve it to cold because only at near room temperature shows its full elegance and charm. First nose is dominated by notes of white flowers, citrus and minerality. After 15 min. typical Mediterranean flavors appears such as resins, underbrush, herbs, ripe quince, honey and dried apricots. Nice touch of smoke and petrol. On the palate, smooth, seamless, oily along with the retained freshness. Finish is long and clean. Food pairing: With mussels, crabs, squid, cheeses, and our recommendation is black risotto with cuttlefish. Mr. Krajančić, from friends clled by his first name - Luka is the man who will surely take the credit when Pošip, the pride of Korčula winemaking, shoots to fame outside Croatia. Combination of low yield per vine and modern vinification techniques creates wines with a polished international style, which can bring negative comments from fellow islanders on the account of disrespect of tradition. But Luka is not worried because he took traditional winemaking to a higher level and still remained true to his roots. Luka is also a passionate poet, in love with the sea and his island, so he believes in the freedom of artistic expression, both when it comes to words and wine. As he said, it takes a bit of creativity and insanity to do what he does. Even those who are far from being wine geeks will recognize the warmth and aromas of the south Adriatic island in Krajančić's wines, but reinterpreted in his way. 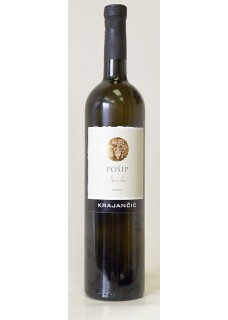 His most popular product is the elegant and well-balanced Pošip Intrada, a benchmark wine for the whole variety. Pošip Sur lie is another story, a complex and mature wine for real connoisseurs, which can compete with any great white in the world. We dare say that the best kept secret in Croatian wine world is Luka's red wine Plavac mali, which should hopefully enter the market in near future.